For the arabian horse lover and Crabbet fanatic one of life’s must-do occasions is to attend a Crabbet Convention. As time dilutes the gene pool of the Crabbet arabian horse, it is even more important for like-minded breeders to get together and share thoughts, dreams – and horses. The latest convention was held in the British town of Buckingham in July 2013. I travelled there with my mother, New Zealand’s only pure Crabbet arabian breeder Lyn Marshall, of Aurora Stud. This is my account of the equine side of our trip. Our first equine encounter was not with arabians, but with polo ponies, at the yard of the famous Black Bear polo team in Henley-on-Thames. This place is truly horse heaven. This is a fabulous operation, with several polo fields, a massive all-weather arena, new custom-designed air conditioned stables, and even a series of horse cover washing machines and dryers underneath the staff quarters. We were also able to visit the operation’s stud farm just down the road. Here, polo ponies are specially bred, including with AI and embryo transfer. And then – just after a week from our touchdown, the main excuse for our trip had arrived – the Crabbet Convention! Our friends drove us up to the town of Buckingham – this being a town not on the rail network, or any other network for that matter. Bub Curtain of Monarch Lodge Arabians in Australia displays the Faris pedigree. Us two lone Kiwis at the convention were soon outnumbered by about a dozen Australians, and we met many people with whom we had previously only known through email or phone. Everyone mingled at the welcome reception, and Lyn and I were among the handful of lucky delegates who did not have a printed name card – the famous equestrian artist and Crabbet devotee Peter Upton hand-wrote ours. Much better than a store-bought name tag! There we met Tony Rice, son of Crabbet stallion master Fred Rice. Tony had many memories of the legendary stallion Indian Magic and others. He had brought along many old, original photographs of Crabbet horses in their heyday, as well as Lady Wentworth’s illuminated pedigree of Faris. On the Saturday we all piled into a bus for the trip to Addington Manor, where the parade of horses was held. Unfortunately for our baggage restrictions, there were several trade stands and book stalls, but we plundered them all the same. Our booty included arabian tea-towels, books from previous conventions, Crabbet magazines, purple Crabbet rugby shirts, and two sculptures. So many fantastic horses paraded through the day – nearly 100 – and it was easy to be overwhelmed by the names and pedigrees, so many of which were unfamilar to us down under. The horses were all sorted into family groups, and some appeared more than once. There was also an endurance display, and an exciting costume display with horses and riders at full gallop for the finale. The horses were all presented beautifully, and we all appreciated the effort put in by so many people to get their horses there and show them off. It was a full day of horses, and in the early evening those at the convention gathered for the welcome dinner. We (the Kiwi/Aussie/hybrid contingent) had the company of Peter Upton at our table, and what an entertaining dinner companion! He shared so many stories of Crabbets and Crabbet Park, and his artwork. Peter has an encyclopedic knowledge of bloodlines, and a mind like a steel trap for recalling them. Among many, we heard the fascinating story behind the artwork by Lady Blunt which graces the front of his latest book “The Arab Horse“. What a save that was! A highlight of the evening was a “raffle”, with a prize for almost everyone. This was loosely organised and emceed by US arabian breeder Mark Thomason, also an entertaining speaker. Lyn added many Kiwi items, and the Australians chipped in, too. There were many tired people slinking off to their rooms by the time the revelries concluded at nearly midnight. Joanna Kale talks horses, as Neil and Jackie Dand look on. Lyn Marshall talks Crabbet with Peter Upton. Next day of the conference featured the speakers. Peter Upton spoke on the origins of the “Crabbet Arabian” and how it came about, and its major importance to the arabian breed. He talked about the stud’s history and the evolution of the original mare and stallion lines. Many original artworks – included in “The Arab Horse” were also on display throughout the convention. Opening speaker Peter Upton talked about the early days of Crabbet Park. She said there were moves afoot in Australia for the Crabbet Arabian to be recognised with “rare breed” status, to assist in efforts to preserve the bloodlines. Geneticist Michael Bowling emphasised that genetic problems are present in every breed and represent a minority of any horse’s functional genes. “These diseases are not a problem – we know where they are”. Preferring not to use the term “carrier” when referring to genetic status, instead calling the horse “positive”, Bowling said there were not enough horses in the Crabbet genepool to “discard” some horses. “We have to work around them and with them. Just be open about it,” he said. Bowling described CA as worse than SCID, because of former’s “enormous range of effect”. As expected the topic of genetics opened much discussion from the floor, including the question of voluntary disclosure of a horse’s status to registries. Delegates to the convention included, at center of picture, Samantha Mattocks of The Arabain Magazine, and her parents, Tina and Trevor. British breeder Alexia Ross talked of the “Shrinking Gene Pool”. She said that the Old English (purebreds imported to UK before WW2 and usually over 85% Crabbet) genepool had dwindled, but Crabbet numbers has increased since the last convention in 2005 in Toowoomba, Australia. Many horses in the early days were double registered, being also in the “oriental section” of the General Stud Book (for thoroughbreds), and descendents were able to be registered there up to 1964. Betty Finke talked about the influence of the Crabbet arabian in Europe, with special mention going to Belgium and Bright Wings, the sire of Odessa, in turn the dam of Padron. Finke shared many pictures of performance Crabbets in Belgium and The Netherlands, and noted that higher percentage Crabbets were “coming back”. She said Dutch breeding appeared to mostly comprise of Russian-Crabbet lines, and Crabbets in Germany, Sweden, Denmark and France “take some finding”. Longtime breeder Caroline Sussex also put up some frank comments on genetics. Her Binley Arabian Stud is founded on the lines of the Worth Stud of her mother, Rosemary Archer. Sussex said she was “very adamant” about movement: “If a horse can’t move it can’t do anything”. She advised breeders to look further afield to improve their lines: “Don’t just stick to what you’ve got. Send your mares to other studs”. Chairperson Susan Hawes ended the session with a 15-minute panel discussion on strengthening the Crabbet “Community” to share information and knowledge. Some advice to come out of this session was to breed mares young, then have them embark on a performance career, as their body has adapted. “Mares compete much better”. The day wrapped up at 5.30pm, and there was just enough time to regroup, refresh, before the gala dinner at 7.30pm. The New Zealand and Australian contingent at the 2013 Crabbet Convention. Who’s who? Before the dinner, several local breeders shared some breeding insights on a “virtual stud tour”. These included Dom and Jan Atkinson of Severn Arabians, home to 19 horses, mostly Crabbet, but who describe themselves as “English breeders”, rather than “Crabbet breeders”. They had the late stallion Hanson, and bought Winged Saint in 2009. Natalie Tindall of Moonlight Arabians is the owner of the ridden mare Darees, competes often, and works to promote Crabbet horses. Ridden classes are, she says, “how we’ll get our horses a secure future”. Diana Whittome of Coe-Y-Foel Arabians in west Wales bred her first purebred in 1966 and is the owner of the “living legend” Imad, who is 99.8% Crabbet (by Algol). Imad has won the WAHO Trophy in Britain and has had many showing successes. He is an Arabian Horse Society (AHS) premium stallion and has been performance tested. Anne Brown of Gadebrook stud, the breeder of the Thomason’s late superstar Magic Domino, talked about her stud and its concentration on performance lines. More on Gadebook later. Samantha Mattocks, founder and editor of The Arabian Magazine, generously gave many copies of the lastest Crabbet-Russian edition of the magazine to delegates. Samantha talked about her family’s stud, Ivy Arabians, and their long involvement with breeding and showing in both Britain and abroad. Joanne Kale presents “The Ghost of Crabbet Park” to the Crabbet Convention committee. Lady Wentworth’s illuminated Indian Gold pedigree, at Gadebrook Stud. The Convention stud tour took place over several days, but one day only was to be our lot. We set off with Jackie and Neil Dand, from Australia, arriving at Anne Brown’s Gadebrook Stud, in Oundle. 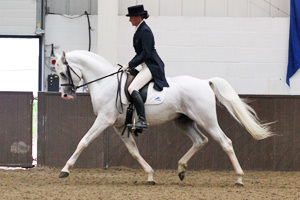 Anne, who was then the incumbent president of the Arabian Horse Society in Britain, breeds for racing, endurance, and ridden showing – not for in-hand showing. This is the home of the stunning snow-white Binley Prince Salim, who was sadly away from home in competition mode when we visited. He was the overall 2013 AHS Performance Horse Award winner, and he also won the AHS Premium Breeders Award for successes in affiliated British Dressage, Endurance to FEI** level and in the showring. But we did see the very striking Russian-bred Sambist, a race-winning stallion who had just turned 26 but didn’t look a day over 10. He was given to Anne and her cousin, Alan Brooks, by Sheikh Abdullah al Thani of Qatar. While at Gadebrook it was a treat for the Aussies present to see the imports Pevensey Zariffa, Inshallah Signature and her foal Bismallah (by Monarch Lodge Ambition), and Palma Benay and her colt by the late Erin Park Excel, whom Lyn and I had seen as a weanling in Australia back in 2006. All of these horses are bay and are part of what’s described as the “Boomerang Plan” to bring back the bay gene to pure Crabbets in Britain. Bob Curtin, of Monarch Lodge Stud, was able to inspect Bismallah at close quarters. We were also able to check out the original illuminated pedigrees created by Lady Wentworth of Indian Gold, Rissalix and Silver Fire. Anne Brown bred the legendary Magic Domino, and the owners of the late stallion, Mark and Kim Thomason, took the opportunity to present Anne with an arabian saddle in thanks. Mark and Kim Thomason present an arabian saddle in memory of Magic Domino to his breeder, Anne Brown. Then it was on to Mark and Natalie Tindall’s Moonlight Arabians, in Leire. There we saw several young stock, including the PC colt MA Moonlight Domino, and Natalie gave a dressage display on her mare, Darees, both with and without a bridle. The day was very hot and seeking shade was a priority, and the Pimms was much appreciated! Several from the stud tour returned to the Ship Inn and Oundle for the night, and the next day the tour continued at Caroline Sussex’s Binley Farm. We were unable to carry on the stud tour as we had to return to base. It was an early start on the morning of Friday, July 26, for us to set off to Malvern (pronounced Morven) for the prestigious British National Arabian Championships. Again, another place with zero public transport options, but we arrived in plenty of time for the Crabbet classes, which were running late. We were grateful to be guests of the Arab Horse Society, and while there we met up with Kitty Carruthers, who is with UK publishing house Medina Publishing, which specialises in Middle-Eastern and arabian books. Before the Crabbets did their thing we watched a few classes from the grandstand, but the “rentacrowd” scene was a turn-off. The whooping and hollaring upset the horses, particularly the young ones, causing them to veer away from the grandstand during their run up. One handler stopped his horse, yelled back at the crowd in no uncertain terms to “shut up”, before he ran his horse out again. This isn’t our thing so to fill in time before the Crabbet classes started, we cruised the trade stands again – though in a reduced mode as our bags were getting rather over-full. Books are heavy! The six Crabbet classes were what we had come to see, and the numbers showing were very encouraging. Open to high precentage Crabbets, most of the horses were shown either by their owners or amateur handlers. There were a few “pro” handlers in the ring, but those who had made the effort to present their own horses were appreciated. The Crabbet classes were judged by Princess Alia of Jordan, who also presented the Princess Muna Saddle of Honour to the SH Sabrina family group. Two-year-old filly Maiad won the overall Crabbet Championship, with the stallion Fairwinds Jedi runner-up. We also caught up again with Peter Upton, who was enjoying the show and helping present prizes in the Crabbet ring. Princess Alia also told me how much she had enjoyed the way the Crabbets were shown and how the owners were enjoying their horses, in contrast to the methods used by some professional handlers abroad. She is a vocal critic of show ring abuse. Princess Alia was presented with a signed copy of Rosemary Archer’s classic book “The Crabbet Arabian Stud”, and the Crabbet Convention Programme. Princess Alia presents the Princess Muna saddle of honour to the SH Sabrina family group. Peter Upton and Princess Alia with stallion class winner Ruadi. As we were preparing to leave, it was purely by chance that we saw a pamphlet advertising the young Polish stallion NL Dancing Spirit, who was at Malvern on display but not being shown. The reason for our interest was the fact that he is by the British-owned stallion Pilot. At this time, one of Lyn’s pure Crabbet mares, Silver Crescent, was carrying a Pilot foal. We found Dancing Spirit, and his handler, Miles Buckley, brought him out of his stable and ran him out for us to see. What a stunning young stallion! My pictures don’t do him justice, but he certainly has “the look”. (Lyn’s mare foaled a colt in December, 2013). As the classes had run well over time, our schedule was curtailed somewhat and we reluctantly had to pass up the opportunity to visit Jenny Lees at Pearl Island Arabians. Jenny was hosting a small group who were to be shown the two arabian mares presented to Queen Elizabeth II by King Hamad bin Isa Al Khalifa of Bahrain. The famed Bahraini purebred arabian horses, rarely found outside the Kingdom, have been preserved for years by the rulers of Bahrain, the Al Khalifa dynasty. So we have another reason to return. When and where the next Crabbet Convention will be is uncertain, but each year in August there is the Arabian Horse Days in Poland and the Pride of Poland sale, which we didn’t feel we could stretch our trip to include this year. It’s nice to have a foot in both camps.